THIS ITEM IS NOT AVAILABLE AT PRESENT. WE WILL NOT BE GETTING ANYMORE Star Wars R2-D2 3D Light. From the Star Wars collection by 3D Lighting Innovations. 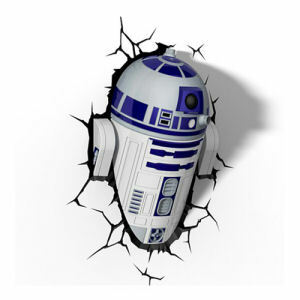 Star Wars R2-D2 3D Light. This battery operated light requires 3 AA batteries that are not included. Uses LED bulbs. Measures 13 inches tall by 10 inches wide by 5 inches long and is made of plastic.